Just got my hardcover copy of Light as a Feather, written by Zoe Aarsen and published by Simon & Schuster, with my photo on the cover! I froze my tush off working the literal graveyard shift to get that shot. And now it seems to be everywhere. Here’s a sneak peek at some of my unit stills from Light as a Feather, premiering Oct. 12 on Hulu. Shooting stills on this show consumed my entire summer, but hey, my photo looks pretty cool on this poster! Check out Light as a Feather on Hulu on Oct. 12. It's gonna be good, especially if you are or have a teen. What a sweet treat! Thanks so much for the feature Voyage LA! I am so honored. Tune in to a New Level of Creepy in Freakish, Season Two! So much fun shooting unit stills on another season of Freakish! Check out Entertainment Weekly's review of season 2, featuring some of my photography, HERE. Gearing Up for Freakish, Season Two! 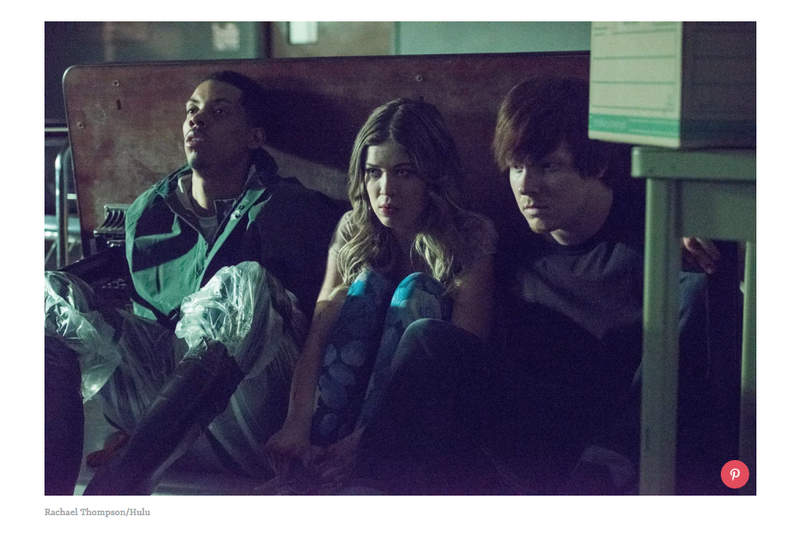 Can't wait to start shooting season two of Freakish on Hulu this month! Thanks for the photo cred, Hollywood Reporter. Just came home to the best surprise: My photo, from the new hit Hulu show Freakish, featured with credit in the Sunday New York Times. These guys — assistant director Brian and second assistant A camera operator Logan — couldn't have been more excited to wrap Freakish a few weeks ago. I'm so glad I was there to capture this behind-the-scenes moment of pure joy and badassery. The series comes to Hulu this fall. Now that I've made the first of several big June deadlines, I finally got the chance to check out my photo in the latest issue of People Magazine. 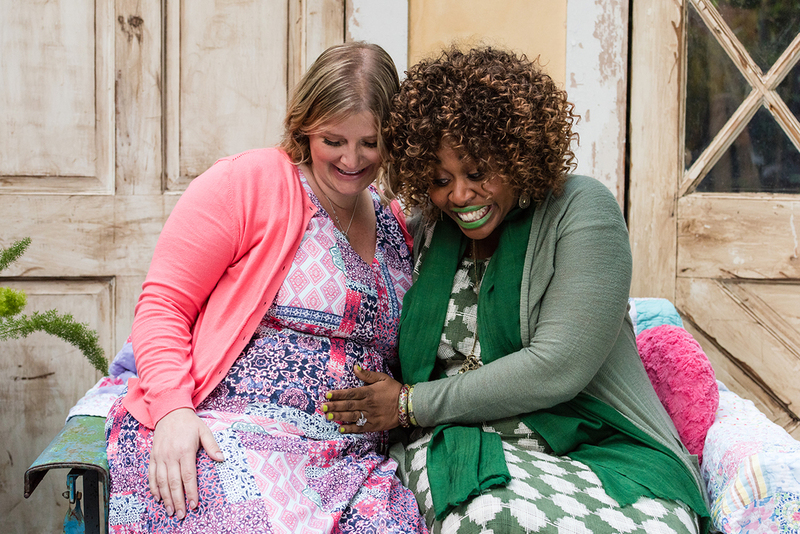 For the last year and a half, I've been part of a small Awestruck crew documenting the fertility journey of GloZell Green, an incredibly strong and funny woman, for her docuseries, Glo All In. A few weeks ago, we celebrated her impending motherhood with an elegant baby shower in Los Angeles. 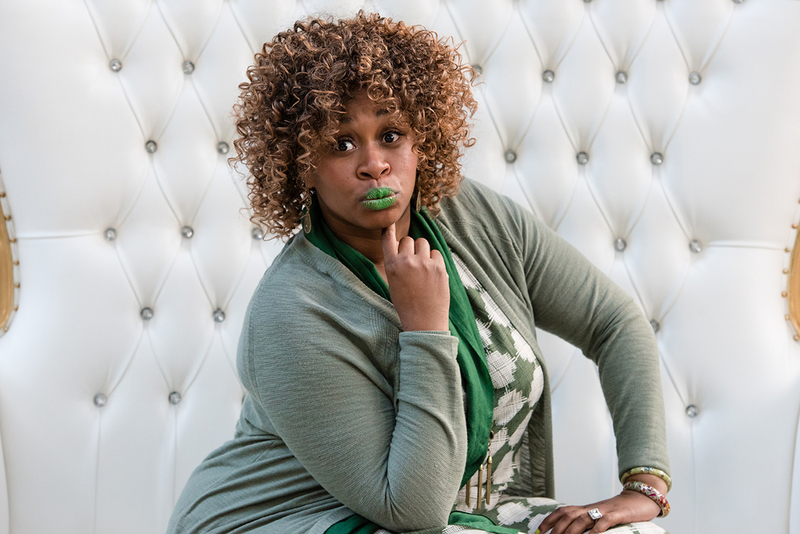 Here are some of my favorite moments with GloZell, her husband, S.K., and their amazing surrogate, Shawna. Gritty. Intuitive. Honest. Details matter. Also, me. Intelligent. Hardworking. Self-sacrificing. Giver of big, squeezy hugs. Also, my mom. Brave. Relentless. Dependable. Rock of her family. Also, my mother-in-law. Intrepid. Genial. Communitarian. Lives to ride. Curious. Idiosyncratic. Formidable. Country music lover. Impassioned. Inspired. Artistic. Independent thinker. The 609 Project is baaaack! My apartment is always bustling with interesting characters. Earlier this year, I decided to photograph them for five weeks. The result of that effort is the 609 Project, a series of black-and-white portraits featuring the various personalities who enliven my home on any given day. Throughout the year, I have periodically photographed additional visitors. I will begin posting their visual stories tomorrow. In the meantime, check out this evolving series here. And remember, if you come to my door, I just might photograph you. I love working as a set photographer. I get to shoot some really cool stuff with really cool people. And, frankly, it's incredibly fun to watch — and document — the production of rad new TV shows and films. 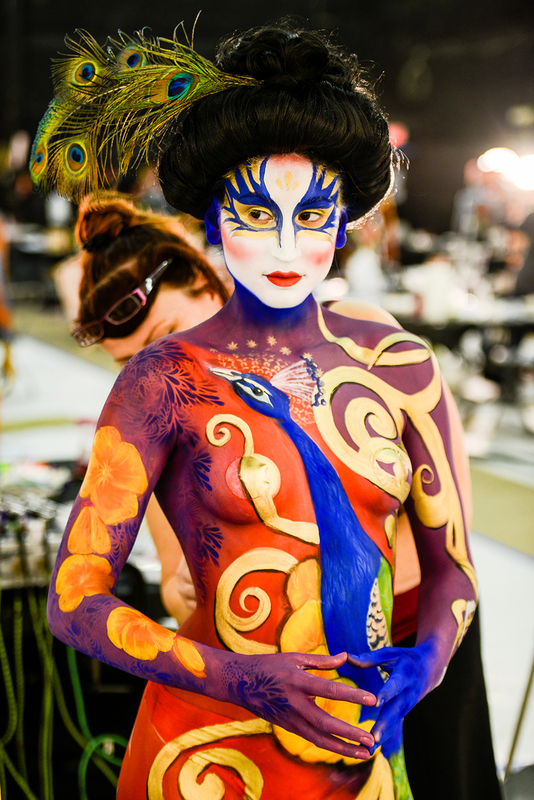 Skin Wars, a bodypainting competition show hosted by Rebecca Romijn, is one such project. 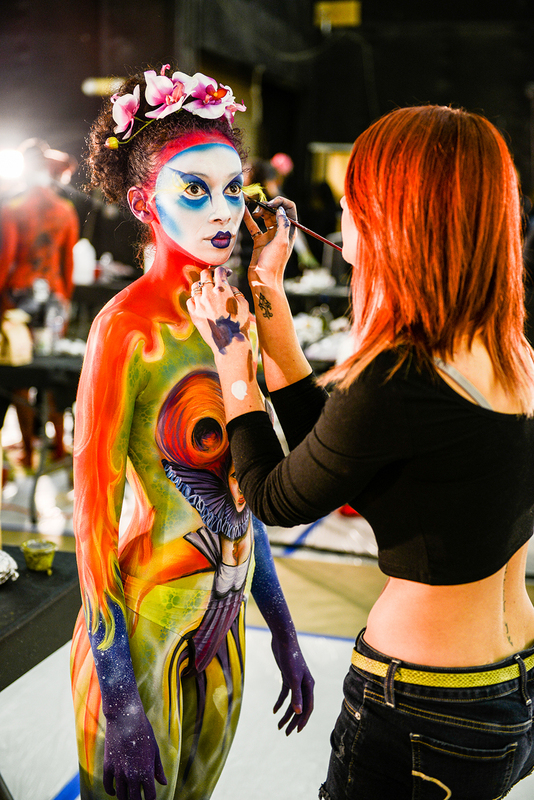 In December, I photographed the show's casting day, where dozens of artists vying to become season two contestants toiled to create wild and captivating masterpieces on human canvases. Ultimately, 12 were chosen. Now, three remain. 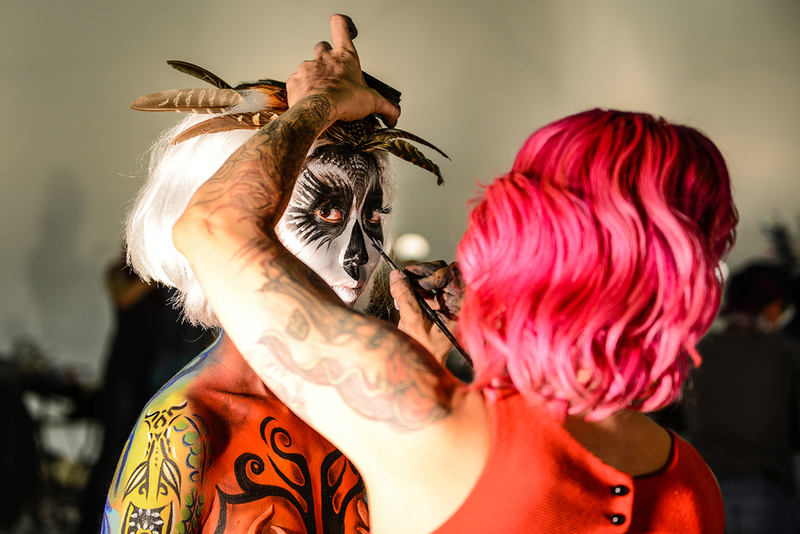 In anticipation of the Skin Wars Season 2 finale tomorrow night on the Game Show Network, here are a few of my favorite casting day moments. A few months ago, I snapped this photo of Academy Award-nominated actress Terry Moore showing off her stunning DeGalluchat handbag before the premier of her latest film, Mansion of Blood. Terry is not only an accomplished actress who has starred in Hollywood films since 1940, but she is also a sweet and kind dog-lover with an infectious laugh who works out with our fun fitness crew in the California sunshine three times a week. It's been a pleasure getting to know you, Terry. A few weeks ago, I had the pleasure of working with Gwen and her family once again as they prepare to welcome their newest bundle of joy to their merry tribe. This expectant mother radiates joy, strength and grace, even in those tough final days of pregnancy. Here are a few of my favorite moments. Shy. Affable. Observant. Loves cars and British indie pop.